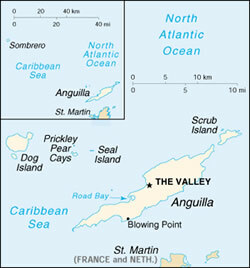 A St Martin Sailing Yacht Charter Itinerary usually will include St. Maartin, St. Barths and Anguilla and offers a unique cultural and natural mix among these islands and their outer cays. Within a week sailing adventure package you will experience the French West Indies (St. Martin and St. Barts), Netherland or Dutch Antilles (St. Maarten) and the British independent island of Anguilla. Below is a sample 7 day St Martin Sailing Yacht Charter Itinerary. You decide the specifics with the captain or bareboat company when you charter a yacht. Day 1: A convenient place to join your yacht is Philipsburg the center of Sint Maarten on the Dutch side, not far from the International airport. You may want to arrive a day early to partake in the unsurpassed duty-free shopping, nightclubs, and casinos. Once settled onboard, sail away into the fresh warm breeze on your luxury yacht around the eastern coast into the French West Indies, St. Martin. Take your first splash in the warm turquoise water at Orient Beach or Ile Pinel a dream world of beautiful sandy cays. Relax, and rejuvenate with a tropical cocktail and island sunset. Have a fabulous meal in the open air cockpit with 360 degree ocean views. Yes, you are really here! 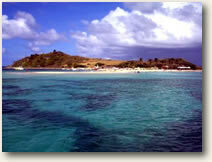 Day 2: Take a short sail to the small island of Tintamarre, off the tip of French St. Martin. Frolic with the sea life as you snorkel the reef in the protected marine preserve. Share your underwater discoveries over lunch and get refreshed for an afternoon walk on the island to hang with the goats. In the afternoon sail back to French St. Martin for a night on the town in Marigot Bay, a small town reminiscent of the south of France. Smell the fresh baked breads and pastries wafting from the cafes and bistros. Stop for some wine and cheese or the fashions and perfumes direct-from-Paris. Or sail on to Grande Case, an historic fishing village, where lovely West Indian buildings house art galleries and gourmet restaurants, a connoisseurs dream. 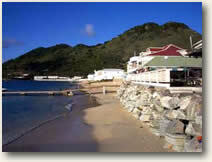 Both these Creole villages are a graceful mix of old world France and the new world West Indies. 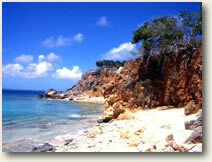 Day 3: For a change of pace, sail to Anguilla and experience the unspoiled Caribbean at its best. This pristine island boasts charming villages, serene harbors and long stretches of white powdery beaches. Drop anchor in Road Town, the main port, where for centuries master craftsmen have built local skiffs and trading boats. Beautiful to behold under sail, these are some of the most finely built vessels in the West Indies. The captain will check in with customs while you enjoy lunch aboard before moving to your anchorage in Crocus Bay. At Flat Cap Point snorkel under the cliffs amidst a marine conservation area. At sunset, watch the pelicans dive for a meal or catch a view of the mating display of the endangered ocean tropic birds that nest on the island. Day 4: Only a short sail brings you to the Prickly Pear Cays and Seal Island Reefs. This is a wonderful scuba diving and snorkeling spot with crystal clear water and vibrantly colored living reefs. Day 5: Get an early start for the island of Ile de la Fourche, off the coast of St. Barts. Herds of wild goats are the most obvious of inhabitants on the cactus covered rocky hills of this secluded island. 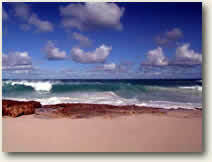 Have an afternoon snorkel and keep your eyes out for the sea turtles that are often seen here. Climb to the top of one of Fourche’s five peaks and take in the panoramic view of the Leeward Islands as the sun sets. If you are their in the spring, look for humpback whales as they migrate south. Day 6: Only a smooth reach south and you will be exploring the French island of St. Barthelemy (St Barts). Anchor at the Gustavia Harbor, a quaint Swedish hamlet (remnant of the original Swedish colony). Here you can snorkel the wreck of the motoryacht, “Nonstop”, which sunk in a storm. Or step ashore, browse the exclusive boutiques, or rent a Moke and tour the isolated beaches (St. Barths is well known for it’s “clothing optional” beaches), and awe the beautiful homes carved out of the hillsides. In the evening you may want to mix in the night life of St. Barts, the St. Tropez of the Caribbean. Jazz and cognac, wine and laughter, and some lively Caribbean dancing. Day 7: Sail around to Anse de Colombier, which frames a splendid beach that is only easily accessible by boat. This is a quiet anchorage where you can snorkel, waterski, kayak or relax in the sunshine. Stay at Colombier and enjoy the peace and tranquility, or sail back to Philipsburg, St. Maarten, only two hours away, for an evening on Dutch St. Maarten. Have one last good shopping spree or visit some of the many casinos and piano bars of Philipsburg. Day 8: One last splash and a fabulous breakfast on deck. It’s time to say good bye, but you can come back soon to try another cruising area in the stunning Caribbean. Your St Martin, St. Maarten, St. Barts, Anguilla Vacation on a yacht will surely tantalize! Browse the available crewed sailing and motor yachts for a St Martin Sailing Yacht Charter Itinerary with a Yacht Search.